Borovets is one of the biggest mountain resorts in Bulgaria. It is located at an elevation of 1300 m on the northern slopes of Rila Mountain, some 70 km away from Sofia, approximately 130 km from Plovdiv, and 10 km south of Samokov. The average temperature in January, the coldest month, is around +4,8° C.
With its closeness to the capital city and its pleasant climate – cool and fresh summer and very snowy winter – the resort is the perfect destination for people who love to spend their holidays in the mountain. The skiing area of Borovets includes 24 trails with a total length of over 58 km, cross-country skiing tracks, biathlon, night skiing facilities and a winter park for children. There are 12 lifts and tow-lifts in total. They are modern, well-maintained, and have excellent capacity. Borovets is the oldest Bulgarian winter resort with a history that dates back to 1896. Borovets was originally established at the end of the 19th Century as a hunting place for the Bulgarian Kings. Borovets gradually developed into a modern ski resort with hotels, restaurants, bars and a network of ski runs and lifts along the slopes of the Rila Mountains, providing for a whole range of winter sports. The resort has twice hosted World Cup Alpine Skiing rounds(1981 and 1984), while the Biathlon track is one of the best in the world. Situated in Beli Iskar village at the foot of the Rila mountain range, Eagle Rock hotel in Borovets ski resort is only 7 km from Borovets and from Samokov town respectively, offering spacious, clean and fully equipped apartments with kitchenette iron with ironing board, free wi-fi, satellite tv and large balconies with magnificent views of the Rila Mountains. The recreational facilities of Eagle Rock hotel in Borovets ski resort include fitness center, sauna, steam bath and massage area, for a relaxing accommodation in Beli Iskar, Borovets. Hotel guests of Eagle Rock hotel in Borovets ski resort can taste mouthwatering traditional dishes in the hotel's restaurant, while enjoying the beauty of the Bulgarian countryside, the silence and peace in comfort, in one of the best apartment hotels in Beli Iskar, Borovets! 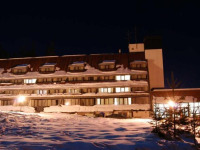 The 3 star Hotel Moura is located in the very center of Borovets ski resort, right across from the cabin ski lift, offering rooms and apartments at very competitive rates among Borovets Hotels in Bulgaria. The hotel has a restaurant with capacity of 120 seats, lobby-bar with a fireplace and conference hall with 25 seats. 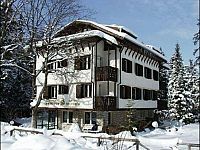 Moura Hotel in Borovets is an ideal choice for guests who look for ski-in ski-out hotels and inexpensive accommodation in Borovets, Bulgaria! Iglika Palace is primely located in the very centre of Borovets ski resort in Bulgaria, just 100 metres from the Sitnyakovo Express Ski Lift to the Yastrebets Slopes and features a large spa area including an indoor heated pool, a Finnish sauna, a steam bath, a herbal bath, a cold cabin and a solarium. All rooms at the Iglika Palace Hotel in Borovets, provide a balcony with magnificent views of the deep green surroundings and offer to hotel guests free wi-fi, kitchenette and TV. 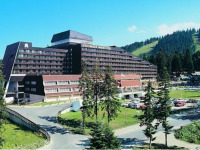 Iglika Palace hotel in Borovets, provides also to guests free parking. Iglika Palace Hotel lays in the heart of the world famous Borovets ski resort and is a place to enjoy your accommodation in Borovets in a cosy atmosphere and get pampered by the hotel's outstanding services! 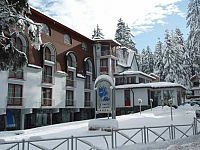 Sveti Georgi Hotel in Borovets is situated in the centre of the Borovets ski resort beneath Rila mountain and surrounded by a beautiful natural landscape of pine trees, away from the noise and close to the ski lifts and ski runs of Borovets ski center. 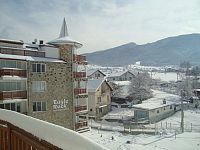 Centrally located just a 5 minute walk away from Borovets town center, Sveti Georgi hotel in Borovets offers clean and comfortable rooms with balcony and gorgeous views of the ski resort, which are all equipped private bathroom, TV, mini fridge and safe deposit, whilst the suites contain fireplace too. Sveti Georgi hotel in Borovets offers to hotel guests sauna, jacuzzi, massage area for a relaxing accommodation in Borovets and 2 restaurants with bulgarian/international cuisine, private parking and free wireless internet for an comfortable accommodation among Borovets hotels! 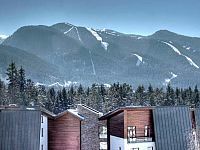 Boasting a central location in Borovets Ski Resort and situated among two ski paths plus the Gondola Ski Lift, Breza hotel offers comfortable accommodation in Borovets, with free wi-fi throughout the whole hotel property. Breza Hotel in Borovets features a cozy lobby bar, a restaurant with a fireplace and a large terrace with barbecue facilities and furthermore is considered as a favorite out-of-town home at the foot of Rila mountain, providing to guests a finnish sauna for their relaxation and a playground for children. Situated in the old centre of the Borovets ski resort, hotel Victoria in Borovets offers great comfort and a cosy atmosphere for your winter or summer holiday, amidst the peace and quiet of Borovets mountain forest. Victoria hotel in Borovets offers to guests 12 comfortable rooms with shower, mini-bar, telephone and cable TV. In the recreational centre of Victoria hotel, guests can relax under the professional hands of the masseur, in the sauna or in the jacuzzi area, for a relaxing accommodation in Borovets ski resort. Victoria hotel in Borovets provides guests with quiet country-style rooms, for a restful accommodation in Borovets ski resort and an exceptional location among Borovets hotels! 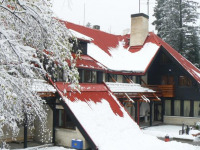 Samokov Hotel in Borovets is a historical eleven store alpine style building, surrounded by old pine forests, offering a pleasant accommodation in Borovets, Bulgaria with first class services throughout the whole year. All hotel rooms are equipped with minibar, satellite TV and bathtubs, whilst the balconies boast breathtaking mountain views. Breakfast and dinner is served daily at the Panorama Restaurant which offers a wonderful mountain view, whilst the Barbecue Terrace next to the swimming pool serves grilled specialities. The hotel's lobby bar serving cakes, sweets and various cocktails as well as the Sports Bar next to the gym. Hotel Samokov also provides a wide range of amusement facilities such as a bowling alley as well as billiards and table tennis facilities.